The Belgium brand Babylonia makes one of my favorite Wrap Conversion Mei-Tai’s – the BB Tai – so I of course was very excited when Nova Naturals (their U.S. distributor) asked me to review one of their newer wraps. 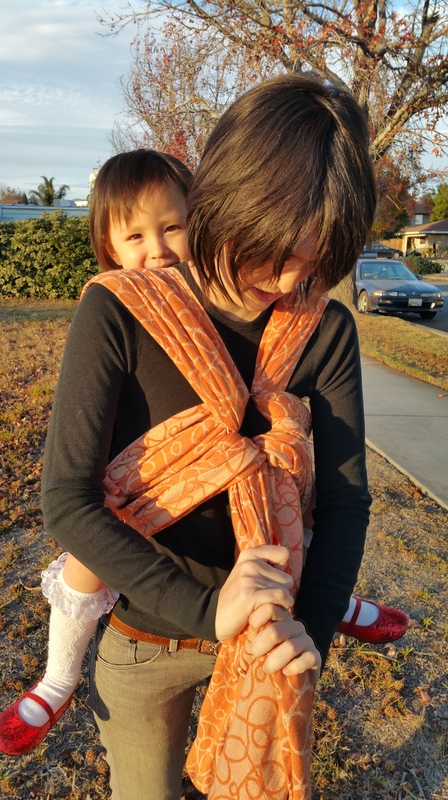 I have had the pleasure of using some of the earlier BB-Slen releases in a few of our local Babywearing International learning libraries, but these wraps were never on my radar because they had a pretty limited selection of patterns. Recently, they have added a few new weaves and colorways, really diversifying their collection. I was sent a BB-Slen Caramel in a Size 6 (4.6 meters). The name is a bit deceiving, this wrap was pretty Orangey (one of my favorite colors) and I was so happy when I opened the box and saw this looking back at me. The other striped wraps I have tried by them have been thin, but this wrap weighed in at 281 g/m^2 which is actually pretty thick. After a wash and air-dry, this 100% cotton wrap came out so, so soft and airy. It took absolutely no breaking in. Despite being so thick, it has this really breathable weave that makes it feel like it would be perfect for a warmer climate, and it’s pliable enough that I knew it would wrap pretty true to size without a knot the size of my head. 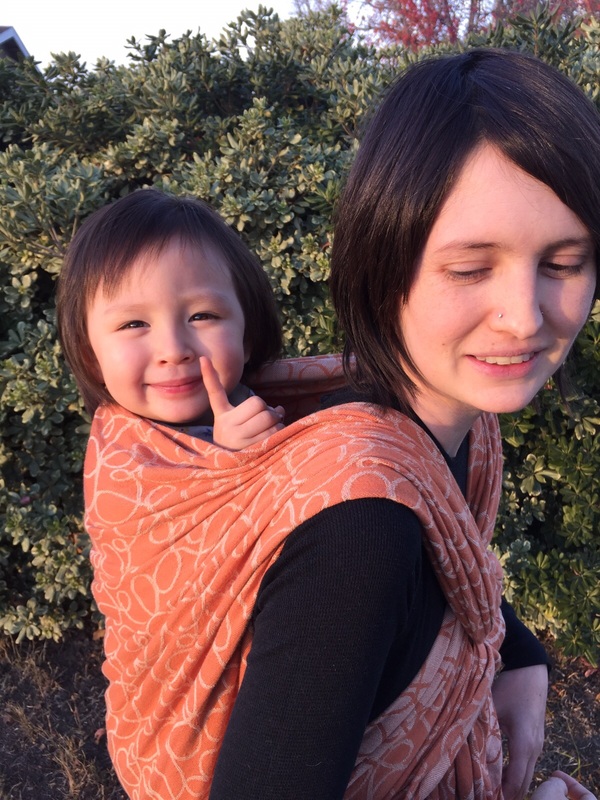 If you have ever felt a Pavo Penumbra, it resembles that wrap in a lot of ways, but with the dryness and airiness of some of the Didymos India’s I have felt. In other words, it has a lot of redeeming qualities for a wrap at such a great price point – and why shouldn’t it? Babylonia has been in this industry for over a decade. I tried it first in a Double Hammock. 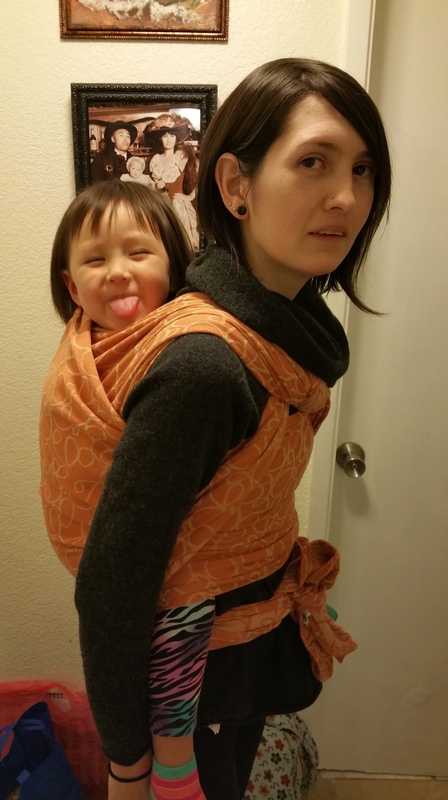 When you are wrapping a 31 lb 3.5 year old, that is pretty much the go-to carry. This time I finished it with a half-knot chest belt. First thing I noticed was the width of the wrap. This woven was 27.5” across (70 cm) giving me ample fabric with which to create a deep seat for my leggy toddler while still having plenty of slack at the top to provide her upper back support. This weave has a lot of grip. It has this light fuzz over the surface that really helps to lock your passes into place. With the thickness and the grip, I did have to put a little work into tightening it – but I was by no means wrestling with it. It did in fact wrap true to size. I wore my Dragon Baby down for her bedtime – a time consuming process – and it remained comfortable through the whole daunting ordeal. I didn’t even feel any pressure from the knot on my chest. Once she was ready to get down, there had been no movement in the wrap whatsoever. There is not much bounce in this weave, just tons of support for even your biggest wearee. I wanted to give it a chance in a single-pass carry too. We took a ‘witching hour’ walk around the neighborhood in a Ruck with a Xena finish. This wrap is great for sling ring finishes! It glides through the rings easily, but stayed in place right where I put it. With this carry I often need to stop to tighten it after some time if I am using a thinner wrap, but the grip really kept everything in place nicely with this BB-Slen. After a long walk, I still felt great! There was no pulling or straining on my shoulders even in a ruck! 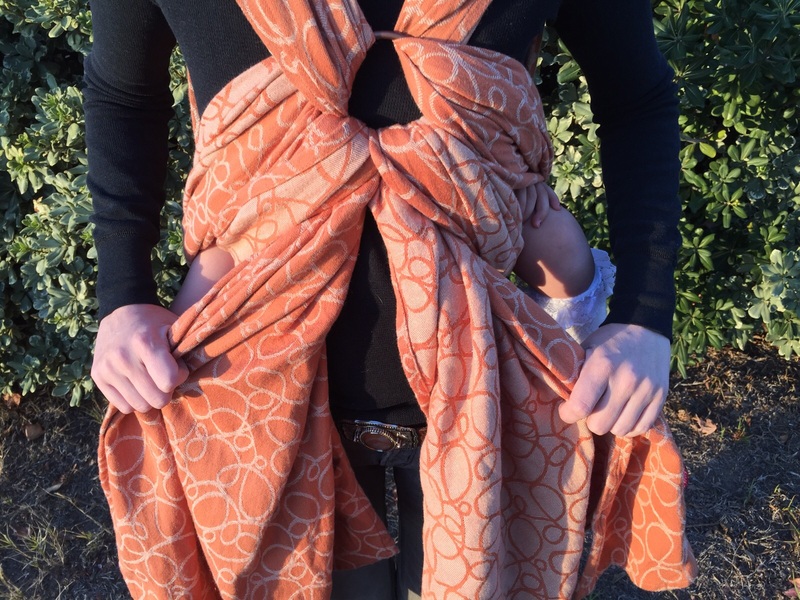 This wrap most definitely stands up to a toddler, something that earlier BB-Slen releases have been known for. With the wideness and thickness of this wrap, you might think that maybe it is only great for experienced wrappers and toddler wearers. Absolutely not! The softness and flexibility of this wrap makes it a great choice for a newborn – the fuzzy feeling of the fabric seems perfect for little squish cuddles. The fact that it took no effort to break in makes it a very approachable wrap for someone who is new to wrapping. And at $119 for a Size 6? You are getting a wrap of amazing quality at a budget price point – one that can comfortably last you through all your wearing days. Did I mention they are woven with Organic Cotton, in Fair Trade workshops in India? The dyes used in the process are non-toxic as well. Babylonia prides itself on being a company who makes sustainable and natural products, and I for one have been a fan of just about everything these guys have introduced to the market. Owner Ingrid Guikers was an avid babywearer and is an educator herself, and you can really feel how she integrates her values into all the aspects of her business. It is the kind of company you feel good about supporting. And now with the addition of all these modern and stylish colorways – BB-Slen’s are going to continue to be a very popular choice for seasoned wearers and first time wrappers alike.